Cardiovascular morbidity in hyperthyroidism is not uncommon, and it can present as high-output heart failure, tachyarrhythmia or dilated cardiomyopathy. Atrial fibrillation (AF) is the most common cardiac complication of hyperthyroidism, affecting about 15% of the patients., AF can cause atrial remodeling, atrial dilatation and, to a lesser extent, significant functional mitral regurgitation (MR)., Isolated left atrial enlargement with normal left ventricular (LV) size and function may cause mitral annular dilatation and, consequently, functional MR. The aim of this case report is to demonstrate that atrial remodeling and functional MR may be reversible when sinus rhythm and euthyroid state are achieved. A 47-year-old female with no notable past medical history presented to our emergency room with a 1-week history of palpitation, gradually worsening dyspnea, orthopnea, paroxysmal nocturnal dyspnea and a lower-limb swelling. The patient had a history of a 10-kg unintentional weight loss, during which she had noted heat intolerance and mood disturbance. She had no history of drug and alcohol consumption. Physical examination revealed diffuse goiter, rapid AF, signs of heart failure including basal crackles, elevated jugular venous pressure and a pansystolic murmur heard over the apex, consistent with significant MR.
A 12-lead resting electrocardiogram confirmed AF with a rapid ventricular response of 130 beats/min. Chest X-ray revealed pulmonary congestion. Basic laboratory blood tests including complete blood count, liver function, renal function, troponin and cardiac enzyme were all within normal ranges. Thyroid function panel was requested. 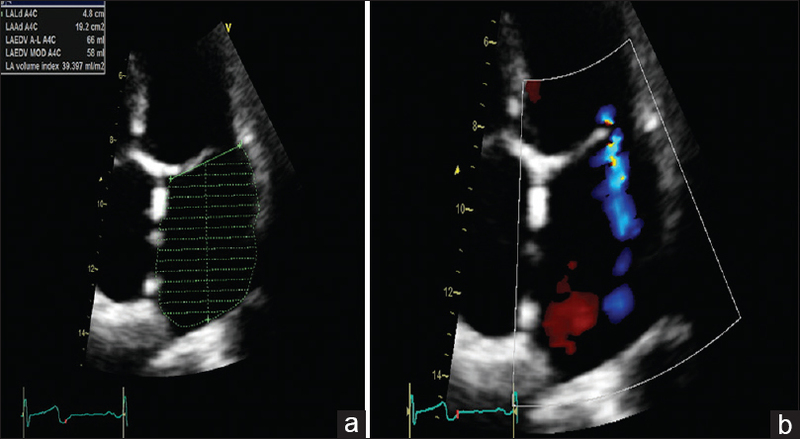 Resting transthoracic echocardiography was done, and it showed globally reduced LV systolic function (estimated ejection fraction of 35%), severe biatrial enlargement and normal mitral valve leaflets with severe MR secondary to annular dilatation [Figure 1]. The patient was admitted to the coronary care unit with a diagnosis of acute heart failure triggered by rapid AF. The proposed etiology was tachycardia-induced cardiomyopathy, and the patient was managed accordingly. The results of the thyroid function were as follows: thyroid-stimulating hormone, <0.0025 ulU/ml; free triiodothyronine, 2.53 pg/ml; and free thyroxine, 1.82 ng/dl. These findings were consistent with that of hyperthyroidism. In addition to the standard heart failure medication (i.e., angiotensin-converting enzyme inhibitors), carbimazole and propranolol (both 10 mg once daily for 6 months) were initiated for the management of hyperthyroidism. Electrical cardioversion was successfully attempted after exclusion of the left atrial and left atrial appendage thrombi by a transesophageal echocardiogram. The patient had a smooth course throughout the hospital stay and was discharged on Day 4 postcardioversion in a good clinical condition. During the 3-month follow-up, she had become clinically and biochemically euthyroid. Thyroid function was normalized, and her cardiac sinus rhythm was maintained. 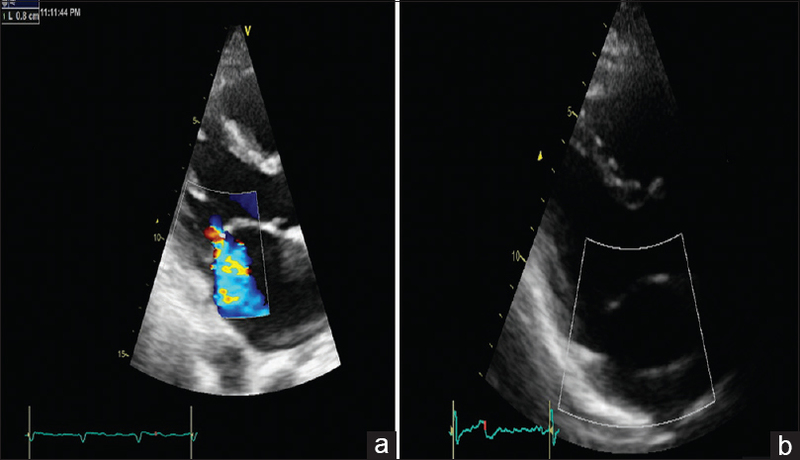 A repeat echocardiogram at 6 months after discharge showed normal global LV systolic function (estimated ejection fraction of 55%), improvement of left and right atrial size and resolution of the severe MR, with only normal physiological mild MR [Figure 2] and [Figure 3]. AF is a common cardiac arrhythmia worldwide, and is considered a common cardiac complication in patients with hyperthyroidism., AF can cause atrial remodeling, atrial dilatation and significant functional MR even with a normal LV size., Because of the lack of coronary artery disease risk factors and the echocardiography findings of global LV hypokinesis without regional variation, we speculated our patient's heart failure mechanism is likely tachycardia-induced cardiomyopathy secondary to rapid AF, which may be complicated by hyperthyroidism. Further, the authors speculated severe functional MR with normal leaflet morphology because of dilated mitral annulus secondary to dilated left atrium. The resolution of the heart failure and echocardiographic findings supported our proposed etiology. Importantly, based on this case, the authors suggest that atrial dilatation secondary to AF with a consequent severe functional MR could be reversed by maintaining sinus rhythm, thereby reversing atrial remodeling. AF, regardless of its etiology, could cause left atrial dilation and remodeling that result in adverse cardiac outcomes. Several possible mechanisms are responsible for atrial remodeling in AF. Increase in ventricular rate results in escalated atrial pressure, causing the atrial wall to stretch and eventually lead to atrial dilatation. Alternately, at the onset of AF, high atrial rate itself induces increased calcium influx. This, in turn, causes the contractile function of the atria to diminish within 3 days, thereby enhancing the increased stretch on the atrial wall and causing atrial dilatation. Mitral annular dilation and functional MR may occur secondary to LV dilation and leaflet tethering. Although studies have shown that left atrial enlargement alone may result in mitral annular dilatation, there are conflicting views on the possibility of this alone resulting in significant MR. In 2013, Ring et al. tested the hypothesis of functional MR secondary to isolated left atrial dilatation by carrying out comprehensive three-dimensional echocardiography studies on 72 patients (functional MR = 19; atrial MR = 33 and controls = 20). The authors analyzed the LV size and function, left atrial dimensions, mitral annular area and leaflet area in the early and late systole and concluded that functional MR can occur secondary to isolated left atrial dilatation, despite normal LV size and function. In terms of treatment, as the patient presented with symptoms of heart failure most likely related to tachycardia-induced cardiomyopathy secondary to rapid AF that may be complicating hyperthyroidism, the authors aimed to treat the primary cause by restoring the sinus rhythm. In 2011, Gertz et al. showed that maintaining sinus rhythm resulted in significant improvement of functional MR secondary to AF. These studies are in accord with the diagnosis and treatment modality of our case. In conclusion, this case report demonstrates that atrial remodeling and functional MR as consequences of AF can be reversed by achieving and maintaining the sinus rhythm and euthyroid state. The authors certify that they have obtained all appropriate patient consent forms. In the form, the patient has given her consent for her images and other clinical information to be reported in the Journal. The patient understands that her name and initials will not be published, and due efforts will be made to conceal her identity, but anonymity cannot be guaranteed. Staffurth JS, Gibberd MC, Fui SN. Arterial embolism in thyrotoxicosis with atrial fibrillation. Br Med J 1977;2:688-90. Sawin CT, Geller A, Wolf PA, Belanger AJ, Baker E, Bacharach P, et al. Low serum thyrotropin concentrations as a risk factor for atrial fibrillation in older persons. N Engl J Med 1994;331:1249-52. Sanfilippo AJ, Abascal VM, Sheehan M, Oertel LB, Harrigan P, Hughes RA, et al. Atrial enlargement as a consequence of atrial fibrillation. A prospective echocardiographic study. Circulation 1990;82:792-7. Schoonderwoerd BA, Ausma J, Crijns HJ, Van Veldhuisen DJ, Blaauw EH, Van Gelder IC, et al. Atrial ultrastructural changes during experimental atrial tachycardia depend on high ventricular rate. J Cardiovasc Electrophysiol 2004;15:1167-74. Kihara T, Gillinov AM, Takasaki K, Fukuda S, Song JM, Shiota M, et al. Mitral regurgitation associated with mitral annular dilation in patients with lone atrial fibrillation: An echocardiographic study. Echocardiography 2009;26:885-9. Schoonderwoerd BA, Van Gelder IC, van Veldhuisen DJ, Tieleman RG, Grandjean JG, Bel KJ, et al. Electrical remodeling and atrial dilation during atrial tachycardia are influenced by ventricular rate: Role of developing tachycardiomyopathy. J Cardiovasc Electrophysiol 2001;12:1404-10. Sun H, Gaspo R, Leblanc N, Nattel S. Cellular mechanisms of atrial contractile dysfunction caused by sustained atrial tachycardia. Circulation 1998;98:719-27. Schotten U, Duytschaever M, Ausma J, Eijsbouts S, Neuberger HR, Allessie M, et al. Electrical and contractile remodeling during the first days of atrial fibrillation go hand in hand. Circulation 2003;107:1433-9. Ring L, Dutka DP, Wells FC, Fynn SP, Shapiro LM, Rana BS. 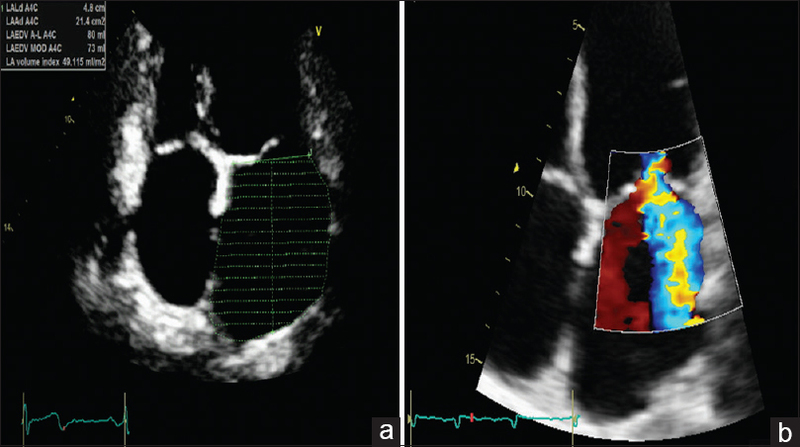 Mechanism of atrial mitral regurgitation: Insights using 3D transoesophageal echo. Eur Heart J Cardiovasc Imaging 2014;15:500-8. Gertz ZM, Raina A, Saghy L, Zado ES, Callans DJ, Marchlinski FE, et al. Evidence of atrial functional mitral regurgitation due to atrial fibrillation: Reversal with arrhythmia control. J Am Coll Cardiol 2011;58:1474-81.